At Prospekt Mira, near the VDHKh Metro Station, a huge monument crowned with two 24-meter figures with a hammer and a sickle in their raised hands towers. 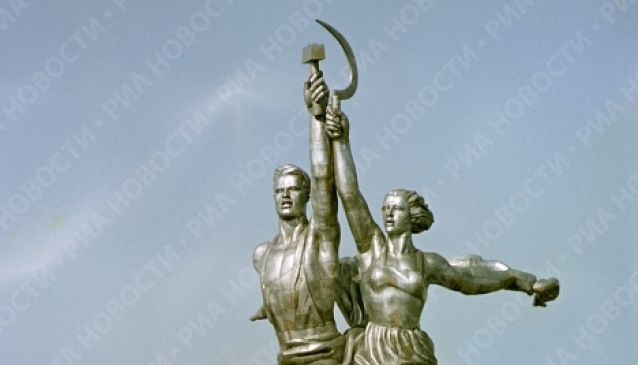 This is a famous Soviet sculpture 'Worker and Kolkhoz Woman' created by Vera Mukhina for the project of Boris Iofan, an architect, demonstrated at the World Fair in Paris in 1937. Along with the hammer and sickle, it has become known worldwide as the symbol of the great Soviet industrialization and collective farming. The museum and exhibition center itself is located inside the monument's pedestal. It serves as a tribute to the works of both creators of the monument. Other exhibitions, usually those of the Soviet art, are also held here, and at the upper level visitors may enjoy Soviet films.